One might think that because I hail from the state of Pennsylvania, I would have rooted for the Philadelphia Phillies in the 2009 World Series. Unfortunately, I never grew fond of the Major League Baseball teams in Philadelphia or Pittsburgh. Since I spent most of my adult years working in New York City (NYC), my heart will always remain in the Big Apple. During my decade of bliss in NYC, I had the pleasure of experiencing and rooting for a team (New York Yankees) that was solely focused on excellence - in baseball that means winning championships. Working at Madison Square Garden (MSG) in the mid 1990's gave me the opportunity to meet Yankees players, attend spring training in Florida, go to over 100 games, sell Yankee advertising and learn about one of the most fierce and determined baseball teams I have ever seen. From 1995-2000, the Yankees provided some of my most thrilling sports moments. Earlier this year, I wrote about Joe Torre (former manager of the Yankees) and the joy that he brought to Manhattan when he managed teams that won 4 out of 5 World Series. The link is below. Joe currently manages the Los Angeles Dodgers and I was hoping they would reach the championship series this year but they lost to the Phillies. It would have been very intriguing to witness the Yankees play against their former coach - a man who made the Yankees shine for 12 glorious years. In that article, I wished the new manager, Joe Girardi well and he has made the champagne pop in the Big Apple. In only his second year, his team is wearing the championship ring! Selling print, signage and TV advertising at MSG allowed me to experience regular season and playoff Yankees games; most often with clients and occasionally with a group of friends. I was there for the final out of the 1996 World series and one of my most memorable sports moments was game one of the 1998 World Series. The Yankees came from behind to win that night and the highlight was a Tino Martinez home-run that sent the crowd into a frenzy of pure joy. I have never witnessed a moment like that in sports and probably never will. Beer was flying everywhere, people were screaming, everyone was hugging and the electricity in the stadium was almost majestic. My friends and the 50,000 plus fans didn't want that night to end! Another perk of MSG was attending the Yankees Spring training in Florida before the season started. We took clients every year and introduced them to a few current and past players. During one trip in 1996, I met the great Reggie Jackson who obviously didn't want to be there as his attitude was sour. That was disappointing for me and many of our clients who remembered his past heroics with the Yankees. One refreshing moment was chatting with and listening to the owner, George Steinbrenner. He was affable and everyone enjoyed his company immensely. As sports fans witnessed from the media over the years, he is a tough minded and no nonsense owner who expects to win the World Series EVERY year. Some of our guests were surprised at his friendly and funny tone as he couldn't have been more pleasant with us. He has travelled a rocky road in managing the Yankees although his one constant is driving his players, coaches and executives to reach for the top every year. He expected and demanded excellence. George is older now and away from the day to day operations although I'm sure he was smiling as he watched his Yankees add another trophy to their previous 26. There are quite a few teams in sports that could take a lesson from the New York Yankees. Far too many prominent sports organizations (no need to mention as sports fans know) lack the drive for excellence or they don't know how to go after it which is evident by mismanagement or losing year after year. Excellence is more than just demanding it. It requires an owner that knows how to put the proper executives in place in order to give his team the best chance to excel. Those executives then need to choose and develop the players best suited for winning. In addition, the choice of a coach is vital as the success of Joe Torre and now Joe Giradi exemplifies. Most importantly, everyone in the organization needs to know, believe and feel (sometimes daily) that winning is expected each and every year despite rebuilding years or obstacles that arise. Since the owner is the ultimate boss, that excellence drive should come from him or her. George Steinbrenner (often called "The Boss") steered the Yankees ship sternly and successfully since the early 1970's. This 2009 championship wouldn't have been possible without his relentless pursuit and passion for winning. Hopefully, his son can carry the torch of excellence into the future and make his father proud. Congratulations to the 2009 World Champion New York Yankees. 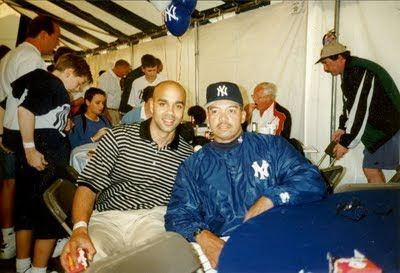 Gswede with "Mr October", Reggie Jackson at Yankees Spring training in 1996. Pursuing excellence is helped a tad with a payroll budget of over 200 million. Other teams struggle to average 85 wins year after year. The real excellence is with teams that win the most per payroll dollar. Fans in all MLB cities should have an opportunity for hope!!! NBA and NFL do this much better than MLB.